2 “One who multiplies joys, divides grief, and whose honesty is inviolable." "One who understands our silence." "A watch that beats true for all time and never runs down." 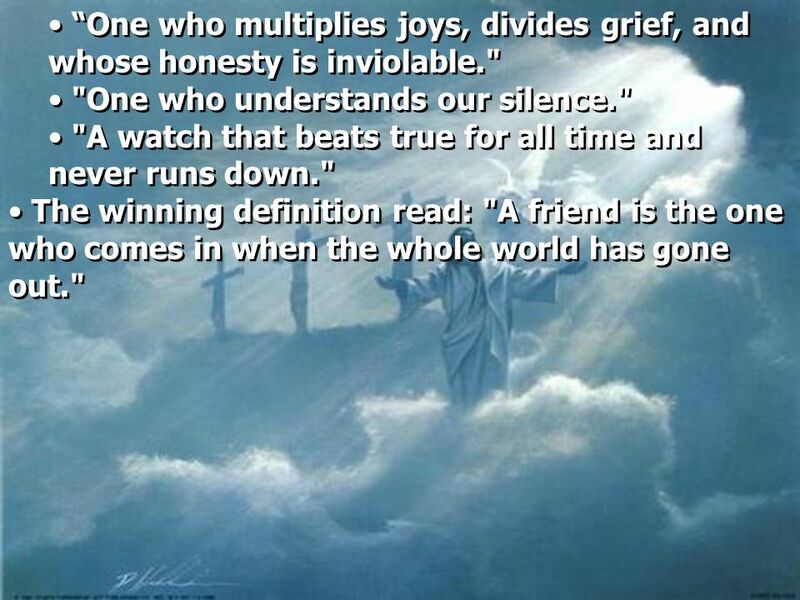 The winning definition read: "A friend is the one who comes in when the whole world has gone out." 3 John 15:9 " As the Father loved Me, I also have loved you; abide in My love. 10 "If you keep My commandments, you will abide in My love, just as I have kept My Father's commandments and abide in His love. 11 "These things I have spoken to you, that My joy may remain in you, and that your joy may be full. 12 "This is My commandment, that you love one another as I have loved you. 13 "Greater love has no one than this, than to lay down one's life for his friends. 14 "You are My friends if you do whatever I command you. 15 "No longer do I call you servants, for a servant does not know what his master is doing; but I have called you friends, for all things that I heard from My Father I have made known to you. 4 Romans 5:7 For scarcely for a righteous man will one die; yet perhaps for a good man someone would even dare to die. 8 But God demonstrates His own love toward us, in that while we were still sinners, Christ died for us. 9 Much more then, having now been justified by His blood, we shall be saved from wrath through Him. 10 For if when we were enemies we were reconciled to God through the death of His Son, much more, having been reconciled, we shall be saved by His life. 11 And not only that, but we also rejoice in God through our Lord Jesus Christ, through whom we have now received the reconciliation. 5 Proverbs 17:17 A friend loves at all times, And a brother is born for adversity. 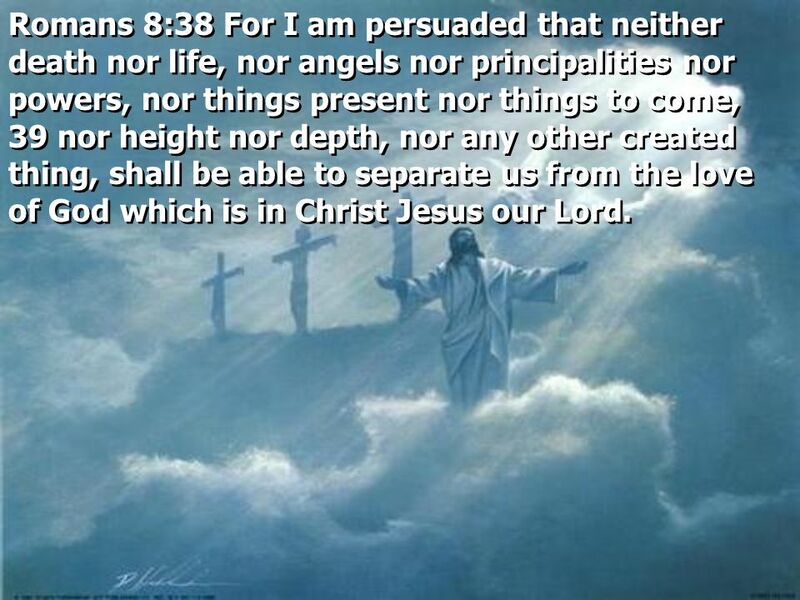 6 Romans 8:38 For I am persuaded that neither death nor life, nor angels nor principalities nor powers, nor things present nor things to come, 39 nor height nor depth, nor any other created thing, shall be able to separate us from the love of God which is in Christ Jesus our Lord. 7 Proverbs 27:6 Faithful are the wounds of a friend, But the kisses of an enemy are deceitful. 8 Proverbs 27:9 Ointment and perfume delight the heart, And the sweetness of a man's friend gives delight by hearty counsel. 9 1 Timothy 2:3 For this is good and acceptable in the sight of God our Savior, 4 who desires all men to be saved and to come to the knowledge of the truth. 11 Hebrews 4:14 Seeing then that we have a great High Priest who has passed through the heavens, Jesus the Son of God, let us hold fast our confession. 15 For we do not have a High Priest who cannot sympathize with our weaknesses, but was in all points tempted as we are, yet without sin. 16 Let us therefore come boldly to the throne of grace, that we may obtain mercy and find grace to help in time of need. 12 Proverbs 27:17 As iron sharpens iron, So a man sharpens the countenance of his friend. 13 Proverbs 18:24 A man who has friends must himself be friendly, But there is a friend who sticks closer than a brother. 14 John 14:1 "Let not your heart be troubled; you believe in God, believe also in Me. 2 "In My Father's house are many mansions; if it were not so, I would have told you. I go to prepare a place for you. 3 "And if I go and prepare a place for you, I will come again and receive you to Myself; that where I am, there you may be also. 16 Ecclesiastes 4:9 Two are better than one, Because they have a good reward for their labor. 10 For if they fall, one will lift up his companion. But woe to him who is alone when he falls, For he has no one to help him up. 11 Again, if two lie down together, they will keep warm; But how can one be warm alone? 12 Though one may be overpowered by another, two can withstand him. And a threefold cord is not quickly broken. 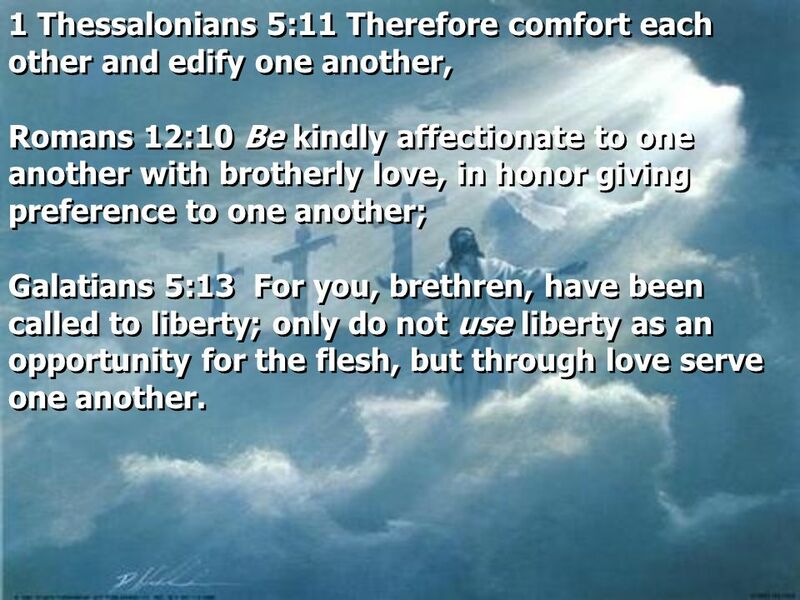 Romans 12:10 Be kindly affectionate to one another with brotherly love, in honor giving preference to one another; Galatians 5:13 For you, brethren, have been called to liberty; only do not use liberty as an opportunity for the flesh, but through love serve one another. 18 Galatians 6:2 Bear one another's burdens, and so fulfill the law of Christ. 20 Matthew 11:28 "Come to Me, all you who labor and are heavy laden, and I will give you rest. 21 2 John 1:9 He who abides in the doctrine of Christ has both the Father and the Son. Do You Know Jesus? Have you experienced His love for you? Have you partaken in the grace of the Father? Download ppt "WHAT A FRIEND WE HAVE IN JESUS"
Right With God Romans 5:1-11 Good news for the present and future. Back to Basics: See that what you have heard from the beginning remains in you. 1 John 2:18-29. 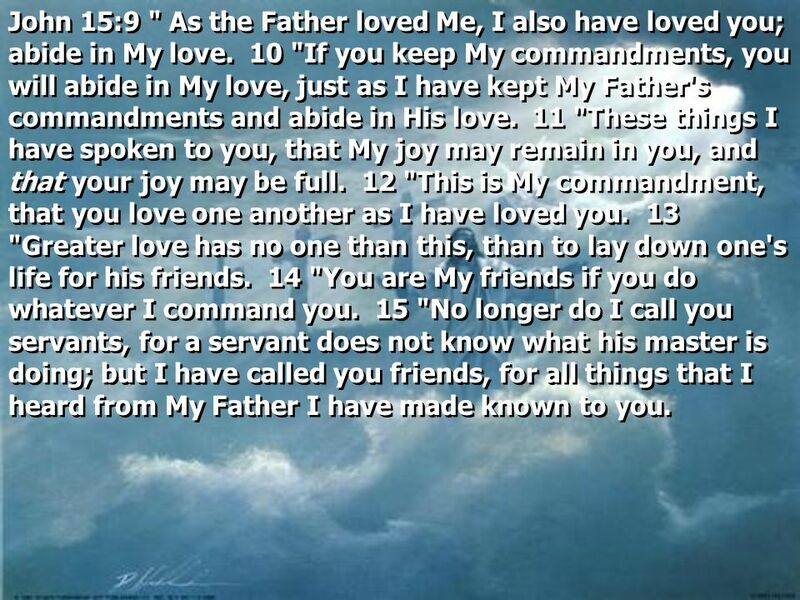 Faith and Friendship John 15:9-17 The basis of true friendship is love! AMAZING LOVE. Is.52: Behold, My Servant shall deal prudently; He shall be exalted and extolled and be very high. 14 Just as many were astonished. Genesis 4:3 And in the process of time it came to pass that Cain brought an offering of the fruit of the ground to the LORD. 4 Abel also brought of the. Heavenly Headlines Proverbs 25:25. As cold water to a weary soul, So is good news from a far country.